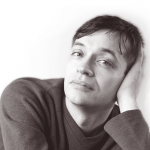 Johnston’s dance writing spans that mythic decade, ‘the sixties’, almost exactly. She had trained in modern dance in the fifties and ‘performed minimally on stage’, also studying art history and literary criticism. After initially publishing some articles in the Dance Observer she became dance critic of the Village Voice in 1959. The following year Johnston found more cause for inspiration: ‘Fresh winds. New people. New movements. New choreography. My head is still full of exciting visions and images…’ She was writing about a performance that included the young Trisha Brown and Yvonne Rainer. She concluded her review by speculating – prophetically – that Robert Dunn’s composition class at the Cunningham Studio, which Brown and Rainer had been taking, ‘might well have some bearing on future developments’. That class was the germ of the Judson Dance Theater, and though Johnston never lost her admiration for Cunningham (‘the only man I unequivocally adored’), most of her dance writings are as an advocate, interpreter, champion of and participant in the Judson movement. Certain names associated with Judson recur time and again: Brown, Rainer, Steve Paxton, Lucinda Childs, Meredith Monk, Deborah Hay, Robert Morris, Robert Rauschenberg. As both a record of and an insight into the Judson movement, these reviews are essential reading. Here, Johnston has an easy, economical style, she is good at tuning you in to a way of seeing work that is not easy to understand (which is one of its points), and she illustrates her arguments with some well-chosen references to other art forms and movements – Dada, surrealism, Marcel Duchamp’s ‘found objects’, the writings of Gertrude Stein and Antonin Artaud. But perhaps John Cage comes up most frequently, and Johnston elucidates his ideas clearly in a number of articles, especially ‘There Is No Silence Now’, showing how he blurs the lines between art and non-art, between performance and everyday life. Likewise, the Judson dancers were to incorporate non-dance and non-dancers into their performances, and to blur the boundaries between art forms with happenings, unannounced and indeterminate performances, and ‘intermedia’ events. But Johnston, especially in the latter half of the decade, has her own manifestos, and as you read through these articles it becomes clear that her focus on the ‘factual’, the ‘thing itself’, is anything but an objectivist, matter-of-fact stance, but saturated with utopian aspirations and visions – not the world as it is, but as it should be. Underpinning her views are the quintessentially sixties’ touchstones (and curiously American, now that I write it) of truth, freedom and democracy wedded to sixties’ ideals of the avant-garde, counter­culture, and rebellion against ‘the system’. So she is delighted by Steve Paxton’s Satisfyin’ Lover with ‘thirty-two any old lovely people in their old clothes from our any old lives… He likes people for the way they are and believes in their physicality… for what it is.’ She finds it liberating, inclusive and democratic. Conversely she distrusts personality cults, star systems and schools of technique – both in choreography (‘the kings and queens of the ballet, the tragic heroes and heroines of modern dance’) and in dance institutions (think Martha Graham, think ballet in general) – because she regards them as authoritarian, hierarchical, old-world or aristocratic. Ballet, inevitably, comes in for particularly short shrift, and the few reviews she gives (the Royal Ballet in Two Pigeons, a mixed programme by the Harkness Ballet) are withering – though pretty funny, if you’re not personally affronted. Johnston was not simply a commentator on the avant-garde art world, but a part of it and the values she celebrated in art increasingly merged with both her writing and her life. She began experimenting with stream-of-consciousness musings, constructing ‘word salads’, playing with puns, neologisms and non-sequiturs; and, true to her life-as-art leanings, also began to write about herself and her world. This breakdown of artistic and critical barriers was very much of a piece with her own personal breakdown – she suffered three episodes of insanity in the latter half of the decade. And it certainly shows in the writing, which became ‘protractedly oracular, megalocentric, and declamatory’. By the end of Marmalade Me, Johnston is no longer writing criticism in any conventional sense; she turns diarist, autobiographer and travel writer in a series of mad, maddening articles which veer wildly between grandiosity and triviality, between comment, description, pontification and self-expression. The Village Voice, keeping track, duly changed the title of her column from ‘Dance’ to ‘Dance Journal’, and finally to simply ‘Jill Johnston’. Johnston’s early dance writings had displayed a kind of (very sixties) politics of liberation, with its transcendent visions of freedom. In the course of that decade she wrote and lived the impossible contradictions of that stance; and she inaugurated the new decade by turning towards a (very seventies) politics of identity: she came out as a lesbian feminist, publishing the landmark Lesbian Nation in 1973. Marmalade Me unwittingly charts that journey through the sixties on a number of levels. One is, of course, as a portrait of Jill Johnston. 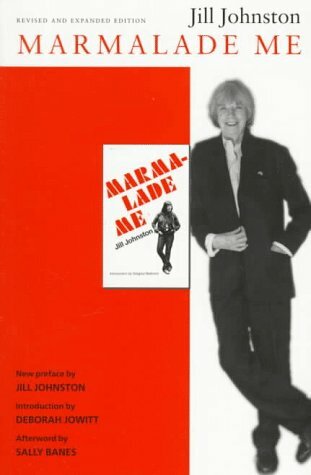 In May 1969, in a characteristically ‘megalocentric’ gesture, she organised a performance panel called ‘The Disintegration of a Critic: An Analysis of Jill Johnston’ – and that could also serve as a subtitle for Marmalade Me. But you can also read the book as a record of the disintegration of art, for Johnston’s subject, style and persona are all deeply enmeshed in the development of avant-garde art in that decade. Or it could be read as the disintegration of a set of utopian ideals. Finally, and by no means least (though I’ve hardly touched upon it here), you could read it as the disintegration of criticism. The myriad issues the book raises – both deliberately and inadvertently – about the purpose, scope, value and validity of criticism would occupy a whole other article. as enlightening, as exhilarating, and as damned exasperating as the mythic ‘sixties’ themselves must have been. But be warned. I suggest you get your bearings first by reading Johnston’s preface, together with the contextual essays by Deborah Jowitt and Sally Banes, and then dip into the rest at leisure – otherwise you might disintegrate a little yourself. For Marmalade Me is every bit as enlightening, as exhilarating, and as damned exasperating as Jill Johnston, the avant-garde art movement, and the mythic ‘sixties’ themselves must have been.